The Rediscovery Centre provides a variety of exciting and interactive workshops that are linked to the primary curriculum and which can be delivered either in our centre, in the Boiler House Ballymun, or in your own classroom. Our educators are trained in the delivery of environmental education and are Garda vetted. The Rediscovery Centre is an accredited Discover Centre under the Discover Primary Science and Maths programme (www.primary-science.ie). 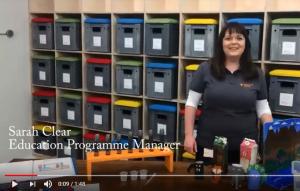 Sarah Clear, Education Programme Manager, in the video below gives you an outline of the fun and educational activities that we do at the Rediscovery Centre. “Very enjoyable, age appropriate, the educator was superb and pitched well” – Virgin Mary BNS, Ballymun, Dublin 9.